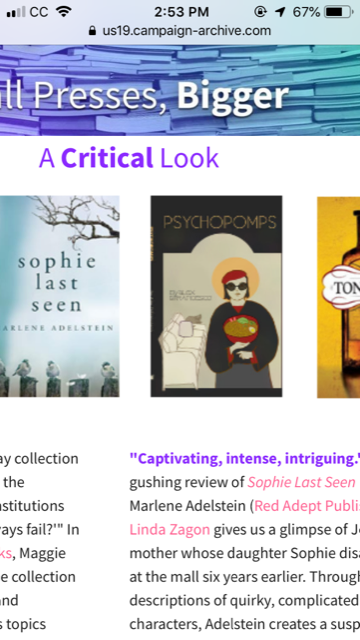 Unique, mysterious, and thoroughly absorbing, Sophie Last Seen is a touching story of love, loss and survival. I loved it." Alison Gaylin, USA Today Bestselling author of If I Die Tonight. 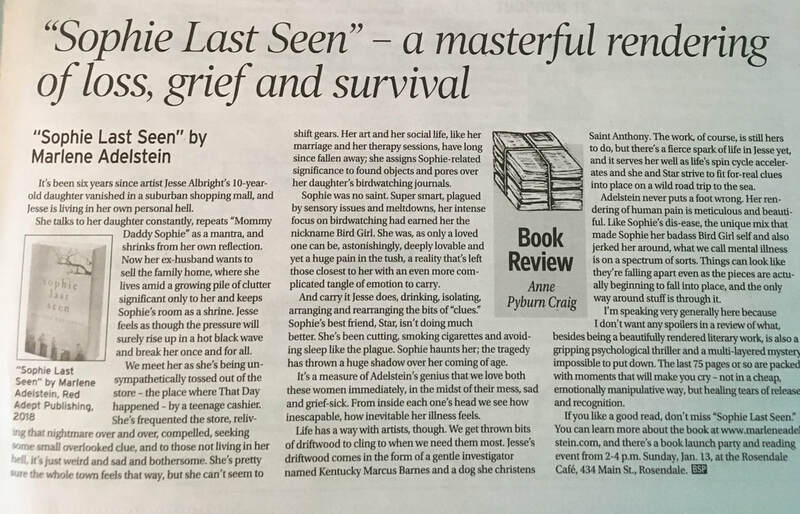 "Sophie Last Seen - a masterful rendering of loss, grief and survival. ...besides being a beautifully rendered literary work, it's also a gripping psychological thriller and a multi-layered mystery, impossible to put down. The last 75 pages or so are packed with moments that will make you cry...healing tears of release and recognition." "A debut thriller tells the story of a woman’s reinvigorated search for her long-missing daughter. Adelstein’s prose is sharp and haunted....the narrative is highly engaging. A finely crafted tale about grief and mother-daughter relationships." In Marlene Adelstein's USA Today Bestselling debut novel, Sophie Last Seen, it is six years since the disappearance of ten year old Sophie from a shopping mall. Her mother is living in a self-destructive limbo as any sense of closure eludes her. Sophie's mom is observed by her daughter’s best friend who carries her own secrets about that day. As the novel opens, Sophie’s mother, Jesse, a lapsed artist, lives a life of near seclusion. Her husband has divorced her, remarried, and had another child while she remains stuck, crazily grasping and collecting ‘finds’, bits and pieces of discarded junk, that she’s certain are clues to her daughter’s whereabouts. Haunted by memories of the intense and difficult child whose obsession with birds filled her young life, Jesse clashes with Star, Sophie’s childhood best friend, now the teenage reminder of all she’s lost. When the two of them decipher a message from Sophie’s birding journal pointing to a whole new explanation for her disappearance, they set off together on a road trip in hopes of some kind of resolution. With the help of a private detective who arrives in town in search of another missing girl, Jesse begins to forgive herself, accept her daughter for who she was and open up to the possibility of a new love. Marlene Adelstein, Author of “Sophie Last Seen” has written an amazing, captivating, intense, intriguing, suspenseful and edgy novel. Marlene Adelstein is an amazing writer, and vividly describes the characters, birds, scenery and landscape. Utilizing all of my senses, I could see, hear, feel, touch, taste and smell many of the events described. Jesse Albright has been in a self-destructive limbo since her 10-year-old daughter, Sophie, disappeared from a shopping mall. Trapped in her grief and guilt, Jesse sleepwalks through her workdays at a bookstore and spends her off hours searching the mall for the face of her missing child. While Jesse yearns for closure, Sophie's best friend, Star Silverman, who may be the key to her daughter's disappearance, starts working at the bookstore. The central character in Marlene Adelstein’s book isn’t even there. Six years after losing her daughter Sophie, her mother Jesse’s entire life revolves around finding her. She has not moved on and, in fact, simply moved inward, dropping friends, social engagements, her art, and losing her husband and then lover, employment, and pretty much what anyone would call sane behavior. Read an interview with Marlene in The Big Thrill, the International Thriller Writers Magazine. Check out The Strange Recital, a podcast about fiction that questions the nature of reality, with Marlene reading an excerpt of Sophie Last Seen and a brief interview with her about writing at the end. What changes inside you when a loved one disappears? Do you become a different person? Maybe this novel is all a metaphor.